Craft Time and Cupcakes: Lesley's Surprise Birthday Hop! Today we celebrate Lesley's birthday! She brings us our lovely Trendy Twine so now it's time for us to bring her a little happy on her birthday. The Trendy Twine design team has come together for this special hop for each of us to create a card for Lesley. Here's what I came up with. I used pink and black papers and a sticker from Anna Griffin and a silver card base from David Tutera Celebrate card making system. And of course the star of the card is the Stormy Trendy Twine.This color is so pretty! I couldn't wait to use it for the first time and I love the way it looks with the pink. Not much instruction on this card, it's very simple layering and a little pink ink on the edges. If you want to see what my Trendy Twine sisters have made the entire hop list is posted below. Make sure you come back tomorrow for another hop! We are celebrating all weekend. HAPPY BIRTHDAY LESLEY!!! I hope you have a wonderful day and many more happy birthdays to come! Oh, how I do love that stormy twine. Great card. So cute! What a bright & super fun card! Great job! What a FUN birthday card!! LOVE the papers and that beautiful twine color!! 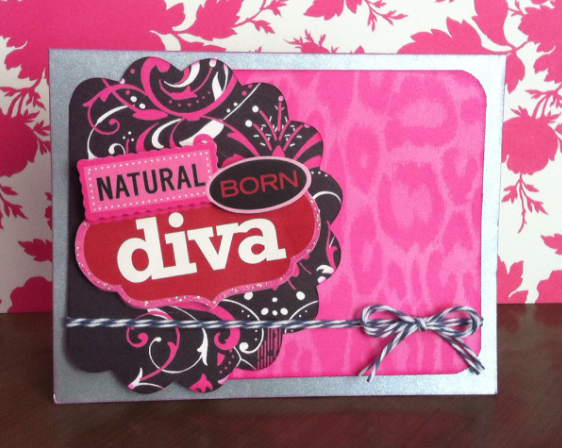 This is such a fun card Kerri! Love it! So incredibly bright Nd cheery! love love love the colors. Haha, great card! Love the pink and black colors together like that. Thank you so much for doing this. Such a sweet surprise! Your colourful card will definitely go the distance in brightening Lesley's birthday. The stormy twine just 'ties' everything together wonderfully. I'm a follower of your site via Google Reader - thank you for sharing and inspiring. Nice job! Kerri. What a great card! Groovy card. Love the pink and black ! Love the pink! Great card! Oh boy is that perfect! hehehe so Lesley. Cute card Kerri. I love the beautiful color combo you used.